The theater is filled with complete darkness coupled with terrifying recordings of trapped victims. Before we can blink, distinct memoires of shock, anger, sadness and grief fill our minds. A chill is sent down our spines before we can take another breath. We vividly remember where we were and what we were doing upon hearing the news that the hijacked planes hit the World Trade Center on September 11th. “Zero Dark Thirty” is a revealing chronicle of the 10-year fight to capture al-Qaeda terrorist leader Osama bin Laden and his death carried out by Navy SEAL Team Six. Kathryn Bigelow (director) and Mark Boal (screenwriter), who brought us the Academy Award winning film, “The Hurt Locker” (2008), team up again for another electrifying war related film. This action thriller based on true events is named after the military terminology for the dark of night, as well as the moment when the Navy SEALs stepped foot on bin Laden’s compound in Abbottabad, Pakistan at 12:30 a.m. – half past midnight, the time of bin Laden’s death. The story is told through the eyes of a young, determined and brazen CIA officer Maya (Jessica Chastain, “Lawless” 2012) whose memorable statement sums up her character, “A lot of my friends have died during this. I believe I was spared so I could finish the job.” Maya, who is based on a real hero, is defined primarily by her femininity in this male-dominated profession. She is described by colleagues like CIA strategist, Joseph Bradley (Kyle Chandler, “Friday Night Lights”) as a “killer” upon arrival to the U.S. Embassy in Islamabad, Pakistan. One of Maya’s colleagues is a rugged, don’t-mess-with-me guy, Dan (Jason Clarke, “Lawless” 2012), who invites Maya to join him during his frightening interrogations. Other impressive co-stars include Joel Edgerton, Jennifer Ehle, Mark Strong, Edgar Ramirez, Chris Pratt and James Gandolfini. The film is a wonderfully crafted, cinematic masterpiece. The story continually changes and reforms based on Maya’s working calculations, keeping us at the edge of our seats. Bigelow’s attention to detail does not go unnoticed nor does her ability to humanize in such large-scale action. She doesn’t withhold anything when it comes to the torture and interrogation scenes, which include water boarding and chaining a naked prisoner to the ceiling with a dog collar, blasting music for hours on end to make him delirious. The rich story telling is intense, realistic and travels at just the right pace. The film’s bona fide locations and guerilla shooting style add to the intensity without making it unbearably nauseating. Chastain’s multifaceted performance is certainly Oscar-worthy for best actress. Come February, I will be shocked if “Zero Dark Thirty” doesn’t sweep the Oscars. The storytelling actually began six years ago when the film was originally going to be about the failure to capture bin Laden in Tora Bora. Then, out of nowhere on May 1, 2011, bin Laden was killed and Boal began rewriting. Boal is a trained journalist and award-winning dramatist who sourced the story so that it could be told accurately. Production designer Jeremy Hindle was reportedly concerned about safety as the replica of Bin Laden’s compound was built and shot in Jordan. Hindle and his team spent three months building the compound out of aged cinder blocks to make it indistinguishable from the photographs they used for reference. Every military base used was built specifically for the film as well. The casting processes was highly demanding as there were over 120 speaking parts, products from more than 1000 auditions around the world. Bottom Line? By far, this is one of the best films of the year, with high intensity, gruesomeness and action to the max. 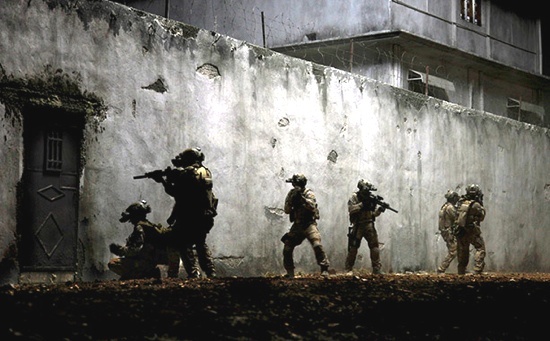 Make seeing “Zero Dark Thirty” one of your New Year’s resolutions. Now playing in LA and New York. In theaters everywhere January 11th.